Snowrator ZX4 Snowplow for Sale. It’s a fact, most of the population hates shoveling snow. It is backbreaking and time-consuming work. When you’re the property manager of any large facility or complex, a snowstorm could mean an extremely long day of snow removal. If you are looking for a way to speed up the process, consider the Snowrator. The Snowrator ZX4 snow plow is designed to operate on sidewalks, driveways and other tight areas where shoveling by hand was previously necessary. The Snowrator is small enough to maneuver in narrow areas but powerful enough to move heavy snowfalls. The Snowrator ZX4 Snow Plow removes snow from sidewalks, driveways and other tight areas. 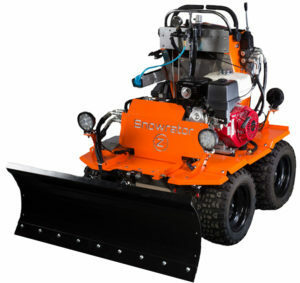 The Snowrator is designed with an electric start Honda GX 390 engine, 4 wheel drive skid steer and a direct dual pump wheel motor transmission with no chains or belts. The durable machine features a corrosion resistant stainless steel construction and 20-gallon liquid de-icing spray system. Check out a video of the Snowrator in action at this link. We have a Snowrator in stock and ready to go at our Plainville Connecticut location. Please contact them today for more information.